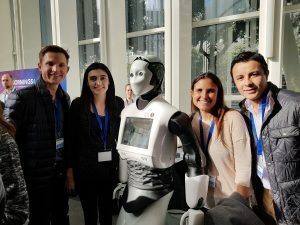 From left to right: EADA students Anton Linkov, Mabel Silvestre, Maria Pia Tregear and Juan Pablo Fonseca pose with the REEM robot from PAL Robotics. 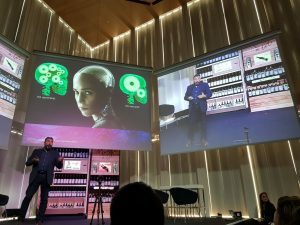 On November 24, the Mornings4 Foundation hosted the first ever “Event on the Fourth Industrial Revolution” in Diagonal Zero in Barcelona. Mornings4 works to create a better future by keeping up to date on 4.0 technologies, and promoting positive views of these technologies. Innovation expert at BBVA Ignacio Villoch answers the question: Can we learn at the same speed that technology advances? The event included several speakers including Kim Faura, General Director at Telefónica Cataluña, and Ignacio Villoch, Open Innovation Senior Ecosystem Builder at BBVA. The presentations focused on a wide range of topics including neuroscience, augmented reality (AR), chatbots, big data and holographic screens. Speakers tackled questions such as: How will robots help us in the future? Can we learn at the same speed as technology develops? Can we predict the jobs of the future? Will we still be paying with credit cards in 5 years’ time? What forms of transport await us? What does a digital democracy look like? Another conference attendee, Tatiana Gottlib, saw a clear connection between her classes at EADA and the material discussed at the conference. “I was positively surprised with how most of the event topics had been covered or touched on by our professors at EADA,” she said. “It felt good to come prepared and skip all the initial questions – going directly to the core of the issues presented.” The highlight of the Mornings4 event for Tatiana was the opportunity to network with potential employers in the field in a more informal, personal environment.